Here are a few of our favorite objects and interiors created by the school's designers. When it comes to decorating, small details make a big difference. Case in point: Our new 1940s-era vintage Art Deco ashtrays ($35, pictured below), which lend a subtle, graphic touch to any coffee table and are lightweight enough to move easily between indoors and out. The striking geometric ribbed shape has a sophisticated feel that harks back to a century-old movement that's now trending in the design world. Short for Arts Décoratifs, the style originated in Paris in the early 20th century and became popular in the 1920s. 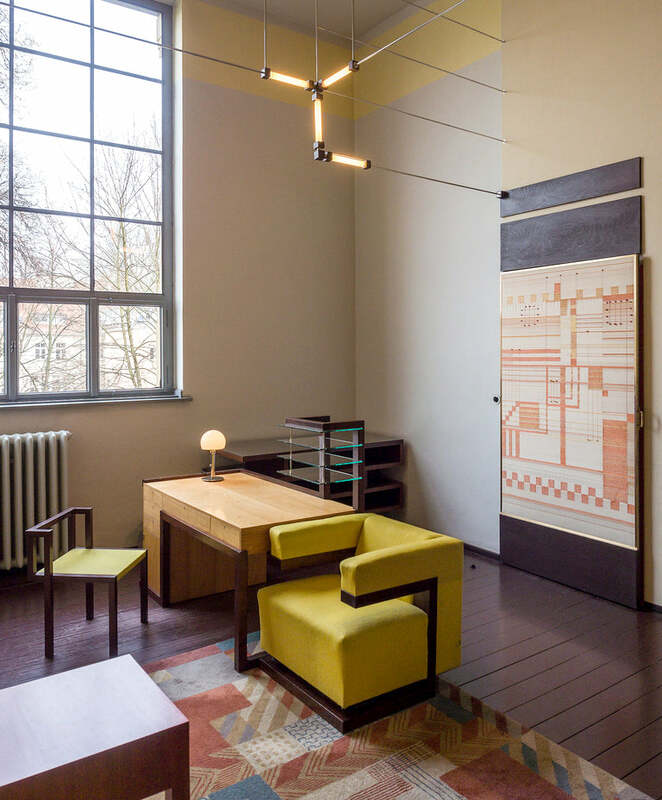 By interpreting old-world luxury and glamour through a modernist lens, Art Deco balanced beauty and function — and its standout examples of design and architecture are more relevant than ever today. Here are a few of our favorite Art Deco references — old and new. In setting out to develop Tetra's first-ever line of smoking herbs, we were after more than just a pleasant taste. After all, plants — as smoking enthusiasts understand — can have powerful effects on the body and mind. To formulate three different blends that do what they say they will (Serenity, Dream Weaver, and Flower Power, now available in our shop) we turned to the woman who knows more about plant medicine than anyone we've met: Kelsey Barrett. We've known her since she was a Marc Jacobs designer by day and musician by night (in the all-girl Brooklyn band Effi Briest, RIP). Now, after extensive studies of herbal medicine across Europe and California, Barrett has recently settled in the idyllic hamlet of Ojai, California, though she travels widely to consult with private clients and lead workshops under her brand Heavy Nettle. Here, Barrett talks about her journey from fashion to flowers, how she made (and personally tested) Tetra's blends, and why smoking is good for you. How did you get from fashion design to herbal medicine? The process of unifying these pieces of myself first began when I would slip away for lunch break yoga classes in SoHo. When coworkers would go for their afternoon latte at Balthazar, I would take a handstand in the fabric room. My yoga practice, mixed with diving into energy work at the Maha Rose healing center in Brooklyn, was a catalyst for me to relax and clear my internal landscape. As my career deepened, I began offering energy work to clients. While doing this, I would enter into visionary states, where I would often see plants popping out of people's bodies. To put it simply, spirit communicates to me in the language of flowers and plants. I followed that communication to France to study with my teachers Julia Graves and Matthew Wood. I then took an apprenticeship in organic farming at Esalen in Big Sur and studied at Ohlone Herbal Center in Berkeley, where I became a director and faculty member. What, if anything, do fashion and plant medicine have in common? The impulse to create and buy clothing can stem from authentic self-expression and be a direct mirror of the internal landscape, enriching and energizing. Working with whole plants and trees medicinally, and creating wellness plans for sustainable self-care, also supports people to feel vital and embodied. Yet the shadow of contemporary fast fashion plays on insecurities, consumerist stimulation, and unsustainable farming practices. Fashion can be so easily misused as a Band-Aid for a deeper need for self-acceptance. I find that plant medicine is less encumbered by the human will, ego, and shadow — and when used correctly, illuminates personal and collective evolution. What have been some of the most surprising plant powers that you've discovered in your studies and practice? When a person and a plant come together at the right moment, it can be literally magical. I was working with a client who had a trauma which propelled her into a state of hypochondria. I had learned from my teacher Matt Wood to use blue vervaine for obsessive compulsive thinking. Within two weeks of her using the formula, she reported an 80% reduction in her thought pattern. I use blue vervaine with other clients that have panic attacks or nervous system up-regulation that stems from repeating thoughts, and it's a wondrous ally! At one workshop, we spoke about rosemary being known as a plant that invokes remembrance, and is historically used at both weddings and funerals. Science now tells us that if rosemary is smelled while studying for a test, and it's brought into the test environment, the test taker will remember 75% more information. What kinds of clients do you work with? How do you formulate blends for them? I see a wide variety of people, yet I tend to serve career women in cities. I used to be one myself, and I imagine we can relate well. My formulation skills come from years of studying with the Traditional Chinese Medicine diagnostic master Dr. William Morris. From Will, I learned to not simply nourish a deficiency in the body, but remove the block, which can be anything from stressful thinking patterns to difficulty expelling toxins to latent pathology. Once the block is moved, the nurturing life force will send the right nutrients to the deficiency. I often calculate quantities and proportions in a formula by using a fibonacci sequence, also known as the golden ratio, which is a mathematical sequence that has biological significance in the growth of many natural objects like the brackets of a pine cone, an artichoke, leaf formations on a branch, et cetera. I find this enhances the formula's effectiveness. Where and when do you forage? What are some herbs you can find around Ojai? ​I forage in all seasons. Spring, especially, possesses a special pop of vibrant growth that is intoxicating. Foraging must be practiced carefully​, as many of our powerful medicinal plants have become endangered. But since plants and trees have evolved alongside humans, they can thrive when foraged or pruned with knowledge and care. For example, oak trees will produce more acorns if they are lightly tapped on the exterior, and they happen to be something I love to forage in California. In Ojai, I've found that the mimosa tree is blooming in the landscaped yards all around town. Mimosa is also called the tree of happiness, and I like to make tinctures with the flower and inner bark. When flower and bark are combined, the medicine acts like all three major antidepressant pharmaceuticals on the market. I like to use this medicine when a client can't see beyond the murky waters of their life experience and needs a temporary lift so they can stabilize and take action to shift the totality of their life into a world they want to inhabit. It's not surprising that I'm also finding lots of cooling remedies in these hot agricultural and wild lands, including sage, peach leaf, and elderflower. It's true that the medicine we need is so often growing around us. How big is your stockpile of herbs? Where else do they come from? ​My apothecary shelves are stocked with around 100 plants, and I have my favorites. I tend to move in cycles, exploring a specific medicine. I've learned that native people would cultivate wild medicinal patches; you not only grew your food in your garden patch, you also grew your medicines. So I like to source from growers that have a personal relationship to land, like Pacific Botanicals and the Sonoma County Herb Exchange, and grow a modest medicinal patch in my own front yard. How did you formulate the Tetra smoking blends? From the vantage point of phytochemicals, smoking plants does break down the plant material and release its medicine, which is absorbed through the lung tissue. While I was formulating the Serenity blend, I chose plants that would effect the nervous system of diverse areas of the body. Smoking flowers is beyond an experience of sheer physical beauty, and the Flower Power blend is emotionally uplifting. Dream Weaver is formulated with California poppy, which was traditionally used by Native Californians for sleep, and mugwort, which is a dream-time plant in the European pharmacopoeia. Creating these formulas took time. I would take time out in nature to smoke each blend with full presence, then slightly alter the formulas for a satisfying taste and optimal somatic impact. Why can smoking be good for you? Smoking plants is a collective ritual of relaxation. It allows for a connection to the exterior world with the interior landscape of our lungs. In most traditional cultures, smoking is a way to carry prayer into the unseen realms and is associated with the element of ether, which treats and clears the mind of patterns. Before people understood the concept of germs, there were many cultures that believed all illness entered the body through evil winds, afflictions from your ancestors, or the evil eye. Smoke was a way to clear illness and evil off and out of the body. Often plants with high essential oil content were burned; for example, myrrh is a traditional herb that is burned in Christian ceremony to sanctify the space. We now know the smoke can kill E.coli, staph, and many other bacteria and viruses. Even if we aren't thinking about smoking this way when we do it, I believe we still intuitively use the practice to connect to self with spirit, clear our minds, and take a moment to become conscious of our breath.